Congratulations to Harry Davies 0f Macclesfield who passed his driving test at the very First attempt at Macclesfield Test Centre on the 21st of December. Well done Harry, great drive today following in the footsteps of your brothers and what a great Christmas present for you gaining your freedom and independence. Congratulations to Kirsty Wallis of Macclesfield on passing her driving test in the automatic car at Macclesfield Test Centre on December 21st. We have had such a laugh along the way and it was a pleasure being your driving instructor thank you for all your hard work on your driving lessons and your determination has paid off and now you can enjoy car shopping just in time for Christmas. Well done from your driving instructor Dave Pegram and all the customer support team at Geoff Capes Driving School. Congratulations go to Lucy Price of Macclesfield who passed her driving test at the very FIRST attempt in the automatic car at Macclesfield Test Centre on December 18th. Who would have thought after meeting you for the first time and your fear of driving faster than 10 miles per hour that you would have achieved this great goal. You had really bad weather but your skill and confidence pulled you through. 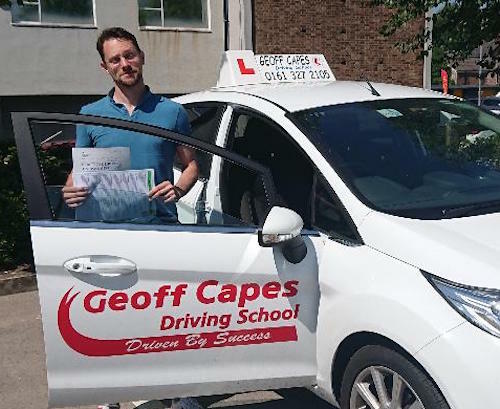 Good luck in your future driving and well done from your driving instructor Dave Pegram and all the customer support team at Geoff Capes Driving School. Congratulations to Dani Carter from Edgeley on passing her driving test on the 14th December at Bredbury Test Centre. I am so proud of you Dani, I am glad you got rid of that nervous tension before your test, it was getting a little too much for you. But what can I say, 1 minor throughout the whole test. An absolute fantastic drive. The examiner said you were a natural driver. From day one it just clicked, fantastic. Best wishes from your driving instructor Paul and all the staff at Geoff Capes Driving School. Congratulations to Charlotte Geoghegan of Stockport on passing her driving test at her very FIRST attempt at Bredbury Test Centre on the 12 December. I am really happy for you Charlotte you have taken every driving lesson in your stride, you are a natural driver. Very confident you can now make your Mum and Dad redundant driving you to work and karate lessons. Best wishes from Paul your driving instructor and all the staff at Geoff Capes Driving School. Congratulations to Rebecca Baker of Stockport who passed her driving test at her very FIRST attempt at Hyde Test Centre on the 11th December. I am so happy for you Rebecca, a fantastic drive. I know you thought you had failed within the first 5 minutes but you held it together and maybe that thought helped you relax and get your license. Even after that and we were driving you home you couldn’t believe it. It’s been a privilege getting to know you and teaching you a skill for life. Big congratulations to Paul Davies of Stockport who passed his driving test on the 10th December at Bredbury Test Centre. I am really happy for you Paul. From our very first nervous driving lessons to today it’s been a privilege teaching you to drive. I have watched you get more confident. I lost count of how many times we turned left near Heaton Chapel train station. From a very nervy start to today, you have passed your driving test now you can be a chauffeur to Sharon. Good luck and drive safe from Paul your driving instructor and all of the team at Geoff Capes Driving School. Congratulations go to Megan Thomason of Stockport on passing her driving test in the automatic car at the very first time of asking at Bredbury test centre on the 10th of December. Megan what a fantastic result and a early Christmas present to yourself, you can now start looking for a car, which car? which colour? And you thought the driving test was hard. Congratulations go to Ben Evans of Macclesfield who passed his driving test at the very FIRST attempt on the 7th of December at Macclesfield Test Centre. Well done Ben now that you have your licence getting to work will be so much easier no more cold mornings and dark nights riding your bike through Bollington. Congratulations to Francesca McKean of Macclesfield on passing her automatic driving test at Macclesfield Test Centre on December 4th at her very FIRST attempt. I hope your new found freedom will make it easier for your journey to work and your Mum can take a break from taxi duty. It has been a pleasure working with you over the last few months best wishes from your driving instructor Dave and all the customer support team at Geoff Capes Driving School. Congratulations to Harrison Wroe from Reddish who passed his driving test at his very FIRST attempt at Sale Test Centre on the 3rd December 2018. It’s been a pleasure to give you driving lessons and to help you find the confidence to go and pass your test. You didn’t know the area around Sale but that didn’t bother you your confidence came through and you did it. Just concentrate on those mirrors. Ha-ha. Take care and drive safe from your driving instructor Paul and all the staff at Geoff Capes Driving School. Congratulations to Stacey McGovern of Congleton who passed her driving test in Macclesfield on 27th November at her very FIRST attempt. Stacey, do you remember those first driving lessons when you thought 2nd gear was too fast? Your perseverance has really paid off, and the extra driving you’ve been doing in your (automatic) Smart car has really helped with your confidence and experience – even if sometimes you forgot that my car has gears! We’ve had some great laughs along the way and I’m really proud of you. Congratulations to Niamh Tyrrell of Glossop who passed her driving test on 23rd November at Hyde Test Centre. An early Christmas present for you today Niamh and a well-deserved one. Do you remember those early driving lessons when we couldn’t even get the car to go in a straight line? Look how far you’ve come since then, I’m so proud of you. I’ll be sorry to see you go as you’ve been a model pupil but I am so pleased that you are now a fully qualified driver. Enjoy your freedom! Congratulations to Dani Hicks from Great Moor, Stockport who passed her driving test at Bredbury Test Centre on the 14th November 2018. A massive congratulations Dani you did fantastic today, you held your nerve and did a great drive, the hours driving lesson before you drove like you had done it for years. Well, maybe not the parallel park!!! You can now get a car drive to work or get a small van and drive your band around. When you’re famous remember who helped you. Ha Ha. Congratulations to Milos Mrksic from Macclesfield who passed his driving test on his FIRST attempt in Macclesfield on 6th November. You did a great job today Milos, conquering your test nerves and keeping it together. This will be a great surprise for your wife when she comes back from her holiday! You already have a car waiting so enjoy all the family trips you have planned. Congratulations to Holly Malins of Bollington who passed her driving test on her FIRST attempt in Macclesfield on 5th November. Well done Holly, I’m so proud of you. You really focussed today, you kept your nerve and had a fantastic drive. Now all you have to do is decide what to study at university – not an easy decision I know! Congratulations to Louise Cooper of Reddish who passed her driving test on the 5th November 2018 at Hyde Test Centre. Congratulations go to Frankie Haddon of Macclesfield on passing her driving test on the 31st October at Macclesfield Test Centre. Well done Frankie a great drive by you today it has now given you your freedom and independence. Looking forward to seeing you for your motorway driving lesson. Congratulations to Davey Hamid from Romiley who passed his driving test at Hyde test centre on the 29th October 2018. A massive well done Davey, It has been a privilege teaching you to drive we got there in the end. I think it’s that Trinidad +Tobago blood in your veins that makes you so relaxed. Nothing seemed to bother you, you just kept saying “relax I will get there. I will be ok” well mate you were and you was !!!! Now get your car insured and get driving . Congratulations to Lewis Parkinson of Reddish on passing his driving test at Bredbury Test Center on the 22nd October 2018. 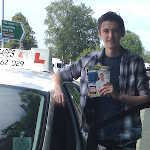 Well done Lewis I am really happy for you today, from that first driving lesson when you were turning the steering wheel and you looked like you were waving at everybody to passing your driving test, and you might have got a new customer for Paul’s company. Smooth ha-ha. Take care and drive safe from Paul you’re driving instructor and all the staff at Geoff Capes Driving School. Congratulations go to Dan Gooding of Macclesfield on passing his driving test on the 18th October at Macclesfield Test Centre. Well done Dan all the hard work and private practice paid off for you. Now you can go and get your car insured and drive safe with your new found freedom and independence. Congratulations go to Beth Topham of Macclesfield who passed her driving test at her very FIRST attempt on the 16th of October at Macclesfield Test Centre. Your examiner said she had a comfortable and enjoyable experience. We have laughed a lot along the way now go and enjoy your new-found freedom being able to do the school run with your daughter. All the best from your driving instructor Dave and all the customer support team here at Geoff Capes Driving School. Congratulations to Josh Hunt of Macclesfield on passing his driving test at the very FIRST attempt on the 16th October at Macclesfield Test Centre. Well done Josh you put a great drive together and you showed your examiner that you are a good safe driver resulting in you gaining your freedom and independence. Congratulations to Zora King of Hadfield who passed her driving test on the 14th October at Hyde Test Centre. A great drive from you today Zora, well worth coming back from University in Liverpool for. The extra practice with your Dad definitely helped and you held those nerves at bay to get the result you deserve. I’m so proud of you. Big congratulations go to Marzena Bheshdi from Macclesfield for passing her driving test in the automatic car at Macclesfield Test Centre on the 9th of October. 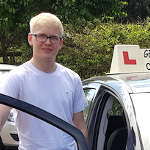 Now you can take your son to football practice and not have to get up too early to catch the bus, I’ve really enjoyed our driving lessons, you now enjoy your new-found freedom. Congratulations to Leah Walsh from Denton who passed her driving test at her very FIRST attempt at Hyde test centre on the 1st October 2018.
and you took to driving like a duck to water. It has been a pleasure to teach and to get to know you. You have given yourself a fantastic birthday present. Congratulations again, take care and drive safe from Paul your driving instructor and all the staff at Geoff Capes Driving School. Congratulations to Toni Gibbons of Glossop who passed her driving test on 21st September at Hyde Test Centre with a CLEAN SHEET. Well Toni, it was worth getting up early and braving the wet weather to get a result like this. I’m so proud of you, well done. Life will be so much easier now that you can take the children to school. Enjoy your holiday next week and safe driving. Congratulations go to Jodie Broadhurst of Macclesfield who passed her driving test on the 14th September at the very FIRST attempt at Macclesfield Test Centre. Proud of you Jodie you worked so hard for this and all that extra practice with your Mum and Dad really paid off for you so now you can enjoy your new-found freedom. Congratulations go to Connor Foster of Stockport who passed his driving test on his very FIRST attempt at Bredbury Test Centre on 14th September. I’m so proud of you Connor, you really focused today and kept your nerve giving a fantastic drive. This test was especially important for you as you are starting your apprenticeship at Airbus in Chester on Monday! So, no more worrying about what train you’ll need to catch, you can now drive yourself to work. Congratulations goes to Annie Williams from Cheadle on passing her driving test in the automatic car at her very FIRST attempt at Bredbury Test Centre on 14th of September. Well done Annie it was worth coming back early from your holiday and getting it done before you go back to university. Congratulations to Aimee Glennon of Marple who passed her driving test at the very FIRST attempt on 14th September at Hyde Test Centre. A great drive from you today Aimee and a well-deserved result. Our mock test yesterday definitely helped. You’ve been a model pupil and I’m sorry to see you go but so pleased to see you get your “wings”. Big congratulations go to Darren Lunn from Stockport for passing his driving test at the very FIRST attempt in the automatic car at Bredbury Test Centre on the 13th of September. A well-deserved pass Darren you worked so hard and got it right on the day, even the examiner said what a great drive you had given her. 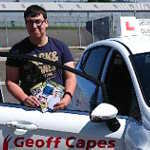 Best wishes for your driving instructor Ian and all the team at Geoff Capes Driving School. Big congratulations go to Lily of Heaton Moor who passed her driving test at her very FIRST attempt at West Didsbury Test Centre on the 12th September 2018. I am so happy for you Lily I could feel the tension and nerves whilst on our way to your test. You held it together and passed with flying colours. You came to me late in your learning to drive journey and we ironed out the creases. Made you into a competent and confident driver but we were limited on time but you went out and smashed it. Now you can go to Newcastle Uni to study Marine Biology. I look forward to seeing you on the Discovery Channel. Congratulations go to Laura Marlow from Macclesfield on passing her driving test on the 10th of September at Macclesfield Test Centre. Laura, we had a few stresses and meltdowns along the way but you held it all together when it was most important, I am so proud of you. Congratulations to Kate Moore of Denton who passed her driving test on 7th September at the very FIRST attempt at Hyde Test Centre. A deserved result today Kate having conquered your nerves and eventually providing a satisfactory signature for your examiner! I’m sure that your children will soon be enjoying the services of their new chauffeur! I will miss our driving lessons together but am so pleased for you. Congratulations to Zach Hancher-Norris of Glossop who passed his driving test on his very FIRST attempt at Hyde test centre on the 4th September 2018. I am really happy for you Zach, on your 1st lesson we talked about your previous learning experience and then improved on it. I have watched you become a more confident and capable driver. once you figured out where to turn when you reversed it was easy. We were on a time scale as you were going off to university and you did it. I wish you all the best for your future. Congratulations again from Paul your driving instructor and all the staff at Geoff Capes Driving School. Big congratulations go to Elizabeth Trafford of Macclesfield on passing her driving test in the automatic car on the 4th of September at Macclesfield Test Centre. Well done Lizzy you kept your nerves in check for the test. You are now able to go shopping for a car and hopefully get the colour of car that you want. 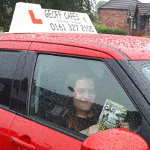 Best wishes Lizzie from your driving instructor Ian and all the customer support team at Geoff Capes Driving School. Congratulations to Rohan Sherwood of Stockport who passed his driving test at Bredbury Test Centre on the 28th August 2018. Well done Rohan I knew you could do it, you had an air of confidence about you today. You can now pick up your son in the car and not in the rain waiting for the bus. I am really happy for you. Take care, drive safe from Paul your driving instructor and all the support staff at Geoff Capes Driving School. Congratulations to Ben Knights of Heaton Moor who passed his driving test at Bredbury Test Centre on the 28th August 2018. I am really happy and proud of you Ben, this has been a long time coming getting made redundant meant it took 15 years. But it’s all over now you have your license so you now don’t need your Dad to pick you when you visit them. Drive safe from Paul your driving Instructor and all the customer support team at Geoff Capes Driving School. Well Andrea you have gone and swapped your American licence for a British one, and I couldn’t be more proud of you. Big congratulations go to Lauren Ricci of Bredbury on passing her driving test in the automatic car at Bredbury test centre on the 23rd of August. Lauren, you are now able to drive yourself to work, and be prepared for a lifetime of being Mum’s taxi for your children, enjoy your new-found freedom. Best wishes for the future from your driving instructor Ian and all the customer support team here at Geoff Capes Driving School. Big congratulations go to Ellie O’Donnell of Stockport on passing her driving test in the automatic car at the very FIRST time of asking at Bredbury Test Centre on the 23rd of August. Well done Ellie the pressure was on you but you handled it so well. Good luck with your drama studies at Oxford University. Best wishes Ellie from your driving instructor Geoff and all the team at Geoff Capes Driving School. Congratulations to Arron Wolstencroft of Glossop who passed his driving test on 23rd August at Hyde Test Centre. A great drive from you today Arron, as you said to your examiner, “you smashed it”! I’m proud of the way you learned from the little mistakes you made on your driving lesson in the hour beforehand, well done you. All you need to do now is find yourself a little runaround and sort your insurance and your freedom awaits. Big congratulations go to Joel Walsh of Bramhall on passing his driving test in the automatic car on the 21st of August at Bredbury Test Centre. Best wishes from your driving instructor Ian and all the customer support team here at Geoff Capes Driving School. Big congratulations go to Lovelyn Goh of Edgeley on passing her driving test at the very FIRST time of asking at Bredbury Test Centre on the 21st of August. Lovelyn the first thing you do when you get in is to speak to your manager and get him to order your company car and authorise your pay increase. Seriously though, I have really enjoyed our driving lessons. Take care and best wishes from your driving instructor Geoff and all the customer support team here at Geoff Capes Driving School. Big congratulations go to Shannan Cooke of Brinnington on passing her driving test at the very FIRST attempt in the automatic car at Bredbury Test Centre on the 16th of August. Well, Shannan the early start certainly paid off, you gave the examiner a lovely drive. The decks are now cleared for you to have a clear run for your pregnancy. I am going to miss our driving lessons. Best wishes for the future from your driving instructor Geoff and all the customer support team at Geoff Capes Driving School. Congratulations to Corben Morris of Romiley who passed his driving test at the FIRST attempt on 15th August at Hyde Test Centre. A great drive from you today Corben, you reached test standard in super quick time and can now look forward to driving to your new apprenticeship. I’m going to miss our driving lessons, but am so pleased for you. Congratulations to Amy Hall of Hazel Grove who passed her driving test on 1st August at Bredbury Test Centre. Well worth getting up early for the first test of the day today Amy and now you can have a bit of a lie-in every day in future rather than getting the train or relying on lifts to work from your colleagues. You’ve been a great pupil, not a bit of trouble and I’m so pleased for you. You have earned this result. Big congratulations go to Matt Johnson of Macclesfield on passing his driving test in the automatic car at Macclesfield Test Centre on 26th July at his very FIRST attempt. Well done Matt you can now take yourself off for a run only thing you will have to do is to run back to the car to get home. Congratulations go to Kerry Gallagher of Macclesfield on passing her driving test on the 24th of July at the very FIRST attempt at Macclesfield Test Centre. Well done Kerry you held your nerves in check and gained your freedom and independence that a driving licence brings. Congratulations to Alex Bashforth of Cheadle Heath who passed his driving test on 20th July at Bredbury Test Centre with a totally CLEAN SHEET awesome. Well done Alex on a literally faultless drive today. The extra practice you did with your Mum and Dad certainly paid off. It was great to see you driving so confidently. Enjoy your Summer away from college and continue to drive safely. 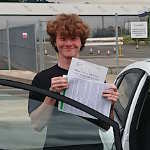 Congratulations go to Swaran Simpson of Heaton Chapel who passed his driving test at Bredbury test centre on 18th July. You really nailed it today Swaran, keeping your cool and giving a fantastic drive. This will be an eventful few days for you, as you’re also starting an apprenticeship on Monday. I hope you enjoy it and all goes well, and it doesn’t take you too long to save up for that much needed car! 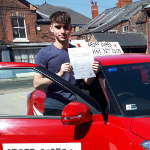 Congratulations to Dan Hawker of Macclesfield who passed his driving test at the very FIRST attempt at Macclesfield Test Centre on the 16th July. Well done Dan a great drive by you today and a great result. Looking forward to seeing you for your motorway driving lesson. Congratulations to Laura Butterworth of Brinnington who passed her driving test on 16th July at Bredbury Test Centre. A great drive for you today Laura and you got the result you deserve. No more relying on lifts and buses to work for you now. I know you’ll be celebrating when you go on holiday tomorrow. Stay safe and enjoy your driving. Congratulations to Lindsay Stewart-Lyall of Hazel Grove who passed her driving test at Cheadle Test Centre on 12th July at her very FIRST attempt. Nobody deserves this more than you Lindsay. You’ve worked so hard to master the car despite your condition, refusing to be beaten. Your incentive was to be able to take your boys to school without relying on others and now you can do that. Enjoy your new found freedom, and don’t forget I want a ride in your new car! I am so proud of you. Congratulations to Tom Woodall of Glossop who passed his driving test on 11th July at Hyde Test Centre. It’s been a long hard journey Tom but we finally got there. I’m so proud of the way you held your nerves at bay and showed your examiner that you are a safe and competent driver. Well done you! 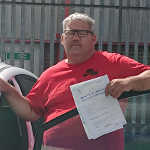 Big congratulations go to Andrew Beard of Shaw Heath on passing his driving test in the automatic car on the 5th July at Bredbury Test Centre. Well, Andrew, this test pass was a long time in the making but you went out and smashed it today. This is now going to make running your vaping business so much easier. 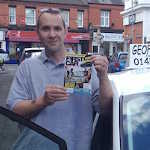 Best wishes Andrew from your driving instructor Geoff and the customer support team at Geoff Capes Driving School. Big congratulations go to Corey Dentith from Macclesfield on passing his driving test in the automatic car on 3rd of July at Macclesfield Test Centre. Corey, you held your nerves together very well today and made me so proud, you can now have the bragging rights over your brother. Big congratulations go to Nicola Owens of Macclesfield on passing her driving test in the automatic car at the very FIRST time on the 29th of June at Macclesfield Test Centre. Well Nicola, the pressure was on you to get the job done before the arrival of your baby in August now the pressure is now off PHEW!!! It has been my pleasure giving you driving lessons for these last few months. Best wishes for your life changing experience from your driving instructor Geoff and the customer support team at Geoff Capes Driving School. Big congratulations go to Thomas Worthington from Wilmslow on passing his driving test in the automatic car at his very FIRST attempt at Cheadle Test Centre on the 26th June. You can now decide which car you are having and enjoy your freedom, so happy that you kept your nerves together. Big congratulations go to Isabella Chance-Larsen of Poynton on passing her driving test in the automatic car on 22nd June at Macclesfield Test Centre. This will help you get to your work placements and University runs, you have been a real pleasure to teach enjoy your new freedom. Congratulations to Simon Harrison of Heaton Chapel who passed his driving test at the FIRST attempt at Hyde Test Centre on 21st June. Well Simon, you won your bet with the guys in your club that you’d pass your test this year, that was the motivation you needed! You can now drive to work there instead of walking home after last orders. I’m sure you will be celebrating in Blackpool this weekend. Well done mate! Congratulations to Louis Gregory from Heaton Chapel who passed his driving test at his FIRST attempt on the 15th June at Bredbury Test Centre. What can I say, Louis, you were constant from day one you just listened and learnt, you now have the benefit of that, your pink licence. It was a pleasure to give you driving lessons. I had confidence in your driving and for you to pass. Hopefully, now you can convince your dad to let you drive one of the vans. Congratulations to Kez Wilson of Heaton Chapel who passed her driving test on 12th June at Hyde Test Centre. There was nothing to be nervous of today was there Kez? But once you controlled that shaky leg, your skills came to the fore. The extra practice you did with your Mum helped a lot. You can now set off travelling next week with one less thing to worry about. I’m missing you already! A massive congratulation goes to Serge Gutin-Hurley from Manchester on passing his driving test on the 7th June 2018 at Hyde Test Centre. I am so happy for you Serge this may not have been your 1st attempt but as time has gone on I have watched your confidence grow, you now know what the mirrors are for and when to use them ha-ha. It has been my pleasure to know you and to teach you to drive. But now you can share the driving on your holiday around Wales with Noel. No arguing who has the keys. Take care, drive safe from Paul your driving instructor and all the staff at Geoff Capes Driving School. Big congratulations go to Lynn Atkinson of Macclesfield on passing her driving test in the automatic car on the 6th of June at Macclesfield Test Centre. I’m so proud of you Lynn and I’m going to miss the chance of us sorting the world out, you can now get the roof off the car and enjoy this beautiful weather we are having. Congratulations to Naomi Sinclair of Marple who passed her driving test at the FIRST attempt on 31st May at Hyde Test Centre. You’re the coolest cookie I’ve had the pleasure to teach for a long time Naomi, you took it all in your stride to follow in the footsteps of your sister last year. It’s been a busy week with you moving house yesterday but you can now relax and look forward to travelling this Summer. Congratulations to Abi Earl from Bredbury who passed her driving test in Bredbury on 30th May on her FIRST attempt. I’m so proud of you Abi, you’ve worked really hard practising with your parents as well as having lessons. Now it’s your time to be the taxi driver for them! We’ve had a laugh over the months, and I hope you have a great time at Salford University when you start in September. Congratulations to Callum Leslie of Gorton who passed his driving test on 24th May at Bredbury Test Centre. I’m so pleased for you Callum as I know how hard it was for you to keep those nerves at bay today but you did yourself proud and deservedly gained your pink license. It’s been a pleasure to teach you to drive, enjoy your new-found freedom. Congratulations to Nathan Cooper from Reddish, who passed his driving test at his very FIRST attempt on the 22nd May at Bredbury Test Centre. It’s been a privilege teaching you to drive, I’m happy for you today you took it all in your stride, not even looking nervous. A credit to yourself. It seems like ages since you started taking driving lessons but then you did take a break to pass your theory. But the break worked well for you. You can have your Saturday mornings back now haha. 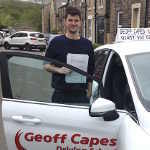 Good luck for the future, take care and drive safe from your driving Instructor Paul and all the support team at Geoff Capes Driving School. 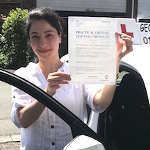 Big congratulations go to Shireen Zahdeh of Macclesfield who passed her driving test in the automatic car at Macclesfield test centre on the 15th of May. You can now drive to your appointments on your own I am so proud of you I have been smiling all day well done. Best wishes from your driving instructor Ian and all the team at Geoff Capes Driving School. 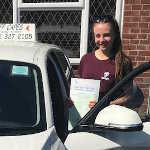 Congratulations to Georgia Cunningham from Poynton who passed her driving test in Macclesfield on 15th May on her FIRST attempt. Well done Georgia for staying calm during the test, I knew you could do it and what a great result. Now you can focus on your exams and look forward to starting the next phase of your life at uni in Falmouth. All the very best for the future from your driving instructor Amanda and all the customer service team here at Geoff Capes. Congratulations to Sam Hawksworth of Glossop who passed his driving test at the very FIRST attempt at Hyde Test Centre on 11th May. I’m so pleased for you Sam, you kept those nerves at bay and gave your examiner an excellent drive. You’ve been a model pupil and I’m going to miss our driving lessons. Enjoy your trip to Portugal in the Summer and you can then concentrate on your future career in art without any distraction. Congratulations to Scott Middleton from Offerton who passed his Driving test at the First Attempt on the 10th May at Bredbury Test Centre. I know that even behind that happy face on the photo you were beaming inside. I am really happy for you Scott you can now go get that job your brother has offered you. You have today proved that when you put your mind to it you can do it. I wish you all the best for the future keep moving forward, from your instructor Paul and all the support staff at Geoff Capes Driving School. Congratulations to Jordon Wright of Ashton who passed his driving test at the FIRST attempt at Hyde Test Centre on 10th May. A great drive from you today Jordon after just around 23 hours of driving lessons, showing just what a natural driver you are. I’m sure that you will be celebrating on your weekend away in Malta, have one for me! It doesn’t seem like 3 years since your brother passed with me. Enjoy your driving mate and stay safe. Congratulations to Sam Cottrell from Hazel Grove who passed his driving test in Macclesfield on 8th May. Well done Sam for a great test performance, I’m really pleased for you. Now you can drive yourself to college and it’s your turn to give your mates a lift! I hope you do just as well with your A level exams and finding an apprenticeship. 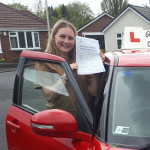 Congratulations to Grace Sharp from Bramhall who passed her driving test in Cheadle on 3rd May on her FIRST attempt. I’m so proud of you Grace for keeping your cool and all your hard work in lessons and with your parents has really paid off. Now you can give your parents a rest and give them a lift in your car! Getting to work and college will be so much easier now you have your independence. Congratulations go to Ellie Jakubowski from Macclesfield who passed her driving test on the 26th April at Macclesfield Test Centre. Well done Ellie, all your hard work and extra practice really paid off resulting in a great pass for you. Best wishes for the future from your driving instructor Andy and all the customer service team here at Geoff Capes Driving School. Congratulations go to Becky Feay from Macclesfield on passing her driving test on the 20th of April at Macclesfield Test Centre. Well done Becky you deserve this result for all the hard work you put into it. It’s been a pleasure giving you driving lessons looking forward to seeing you soon for your motorway lessons. Congratulations to Bex Rushby of Glossop who passed her driving test on 13th April at Hyde Test Centre. Well Bex, all that nagging from myself and your Dad about keeping your speed down finally paid off! I couldn’t be more pleased for you. No more long treks on the bus to Little Giggles for you anymore, your Micra “Minty” awaits! Take care on the road and enjoy your driving. Congratulations to Sean Jurkevicius of Denton who passed his driving test on 13th April at Hyde Test Centre. A lovely drive from you today Sean, we both knew that you’re driving deserved this result but it still had to be done. You have missed out on some work opportunities due to not having a license, but no more. Well done mate. Congratulations to Daniel Kennedy of Heaton Moor who passed his test on 13th April 2018 at West Didsbury Test Centre. A fantastic drive Dan, 2 minors and nothing else all on Friday 13th as well. All that practice in the Citroen with your Dad has paid off. Now between you and your Mum you can decide who is going to use the car the most. Take care, enjoy your year off college/ university. Drive Safe from your driving instructor Paul and all the support staff at Geoff Capes Driving School. Congratulations go to Emma Fitzpatrick of Wilmslow on passing her driving test on the 12th April at Macclesfield Test Centre. A well-deserved pass for you Emma, you managed to hold your nerves together and it enabled you to gain your license and all the freedom and independence that it brings. Best wishes for the future Emma from your driving instructor Andy and all the customer service team here at Geoff Capes Driving School. Big congratulations go to Debra Idakwo of Macclesfield on passing her driving test in the automatic car at Macclesfield test centre on the 10th of April. You can now start looking for a car now Debra and you will save yourself a fortune on taxis. You drove very well today and have made me very proud. Big congratulations go to Andrew Watson from Macclesfield on passing his driving test at his very FIRST attempt in the automatic car on the 10th April at Macclesfield test centre. This result is going to make going to see your parents in Kidsgrove and when your work relocates to Poynton so much easier to get to. I have really enjoyed giving you driving lessons, oh and thank you for the Creme Eggs. Congratulations to Emily Dyson of Glossop who passed her driving test on 6th April at Hyde Test Centre. A great drive from you today Emily and a well deserved result, I’m so pleased for you. Your Mum will be happy too now you are able to drive yourself to dance classes and to work at the nursery. Enjoy your freedom and independence and drive safely. Congratulations go to Danielle Williams of Macclesfield on passing her driving test on the 6th of April at the very FIRST attempt at Macclesfield Test Centre. It has been a pleasure giving you driving lessons and I am looking forward to seeing you for your motorway lessons. Just keep an eye out for the hazard warning lights. All the best for the future Danni from your driving instructor Andy and all the customer service team here at Geoff Capes Driving School. Congratulations to Aimee Fox of Denton who passed her driving test at the very FIRST time on the 5th April at Hyde Test Centre. It’s been a pleasure teaching you to drive. All that rabbiting on in your ear I had to do about using your mirrors? Well it all paid off. I wish you the very best in your career as a nurse, the NHS need people like you. Take care and drive your new car safely from your Driving Instructor Paul and all the support team at Geoff Capes Driving School. Congratulations to Mitch Massa from Heaton Chapel who passed his driving test on his first attempt on the 3rd April at Bredbury Test Centre. After the 1st hour of not going well, you pulled it out of the bag, absolutely chuffed for you, I could see your stress levels rise. Now you can take the dog for a drive in the silver Mini haha….. Make sure you have motorway lessons before you take it on the motorway but as you said it won’t go fast enough. Congratulations from your instructor Paul and all the support team at Geoff Capes Driving School. Congratulations to Zahra Kassim Al-sari from Reddish who passed her driving test at the very first time at Bredbury test centre on the 29th March. Fantastic result for you Zahra. I knew you could do it. The 5 months off for your operation didn’t affect your driving and now no more walking to work or getting the bus to Uni. Ask Ali to let you use her car till you get one!! I look forward to seeing you for motorway lessons, take care and drive safe from your Driving Instructor Paul and all the team at Geoff Capes Driving School. Congratulations to Jordan Barton from Cheadle Heath who passed his driving test on 28th of March at his first attempt at Bredbury test centre. Well done Jordan. you held your nerves. carried out a great reverse park. Now you can go and buy that Polo so you can get to work and sit in all that traffic from Handforth Dean. You will wish you fixed your bike haha. Drive safe and take care from your Driving Instructor Paul and all the team at Geoff Capes Driving School. Congratulations to Ben Goodwin of Hadfield who passed his driving test on 26th March at Hyde Test Centre. Following in the footsteps of your Mum and sister who also passed with me I couldn’t be happier for you Ben. You are an excellent driver and your licence will enable you to get to college easier, as well as to your jobs in the restaurant and painting and decorating. Happy Days! Big congratulations go to Liam Swift of Glossop who passed his driving test at the very FIRST attempt on 23rd March at Hyde Test Centre.Well done Liam, you kept your nerve and gave your examiner a solid drive and deserve your pass. You can now go house hunting in comfort and share the driving to work with your girlfriend. You’ve been a model pupil and I am so proud of you. Stay safe and enjoy your freedom. Congratulations to Steve Eastman of Offerton who passed his driving test on 22nd March at Bredbury Test Centre. A great drive from you today Steve, I know having your licence means a lot to you especially as you have a job interview this afternoon so the day could get even better. I look forward to seeing you soon for a motorway lesson in your Corsa. Congratulations to Hollie-Anne Hunt from Poynton who passed her driving test at Macclesfield test centre on the 20th March. Well done Hollie for keeping your cool on the day, I’m so pleased for you. You put in lots of practice with your mum and it’s really paid off. Now that’s out of the way you can focus on your exams in June. I hope you do yourself proud with them as well, even though you already have an unconditional offer to study at Manchester Met University! 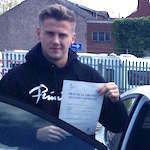 Congratulations go to Louis Bisson of Stockport who passed his driving test on 19th March at Hyde Test Centre. A well deserved result today Louis despite the bad weather, it will be so much easier for you now to attend your drama classes and auditions, not to mention work at Tesco. I’m going to miss our driving lessons but am so pleased for you. Big congratulations go to Anna Sheeren on passing her driving test on the 16th March at Macclesfield test centre. Well done Anna this was a great result for you passing just before the snow came and gaining your freedom and independence, I look forward to seeing you for motorway lessons. All the best for the future from your driving instructor Andy and all the customer service team here at Geoff Capes Driving School. Congratulations to Sam Porter from Stockport who passed his driving test the very FIRST 1st time at Bredbury test centre on the 6th March. Can you share the lottery numbers with me please after the fantastic day you have had? Promotion, passing your driving test and Liverpool qualifying for the next round..Although we will see how Liverpool do on the weekend against United !! …. Sorry had to get you to crouch for the picture your too tall. Good luck with the future, It’s been a pleasure, drive safe from Paul your driving instructor and all the support team at Geoff Capes Driving School. Congratulations to Emmie Sutcliffe from Cheadle Hulme who passed her driving test in Cheadle on 22nd February with NO FAULTS! I’m so proud of you Emmie for keeping your cool and producing that perfect result! I hope you do just as well in your A levels this year and have a fantastic time studying languages at university. Congratulations go to Rachel Vare from Macclesfield on passing her driving test on the 16th February at Macclesfield test centre at her very FIRST attempt. 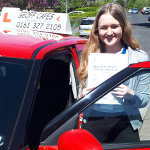 Well done Rachel you have now gained your freedom and independence no more needing to get lifts from parents or friends. You gave a good drive today and was rewarded with a great result . Congratulations to Ellie Woodward from Hazel Grove who passed her driving test in Bredbury on 15th February. I’m so pleased for you Ellie. Your new licence now means you won’t have to worry about how your fellow students are going to get to Stockport to help with filming for your media degree. You can give them a lift in your lovely red mini! Congratulations go to Lily Rigby-Bates of Poynton on passing her driving test on the 15th of February at Macclesfield test centre on her very First attempt. 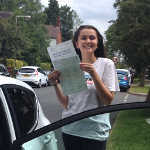 Lily it was a pleasure teaching you I really looked forward to our Thursday morning driving lessons, I hope to see you soon for your motorway lessons. Congratulations go to Katie Lin of Macclesfield on passing her driving test in the automatic car on the 14th February at Macclesfield test centre. You certainly cut it fine Katie with your international licence about to expire, this licence will go with all the others you hold from different countries. It has been a laugh giving you driving lessons. Congratulations go to Daisy Hammersley from Macclesfield on passing her driving test at the very FIRST attempt on the 9th of February at Macclesfield test centre. Well done Daisy, you gave a near faultless drive and gained your freedom and independence, there will be no more needing lifts to school in Macclesfield. Big congratulations go to Mina Fattahi of Levenshulme on passing her driving test in the automatic car at Bredbury test centre on the 7th of February. Congratulations go to Francesca Parrott from Macclesfield who passed her driving test on the 1st of February at Macclesfield test centre. You had a nice drive resulting in a great pass for you. Getting to your new job will be so much easier now you have got your full license. Congratulations go to Eric Gleave of Brinnington who passed his driving test at the First Attempt on 30th January at Hyde Test Centre. A very solid and disciplined drive from you today Eric gave you the result you deserved, you have proved to be a natural driver and learned quickly and you join your brother, Charlie in our list of success stories. A model pupil. Congratulations go to Sophie Buchanan of Stockport, on passing her driving test at the very FIRST attempt on the 22nd Jan at Hyde Test Centre. Nerves can get hold of you, but well done for keeping them in check. You did great. It will be easier for your mum now, as you can ferry your brother and sister around and give her a break. Take care and drive safe. Best wishes from your driving instructor Paul and all the customer support team at Geoff Capes Driving School. Big congratulations go to Hazel Hill from Stockport for passing her driving test in the automatic car at her very FIRST attempt on the 19th of January at Bredbury test centre. You will now be able to look for that new job and be more mobile, you have been a dream pupil enjoy your new freedom. Congratulations to Alex Power of Stockport, who passed his driving test on the 15th January at Bredbury Test Centre. Test passed, car bought and a motorway driving lesson all in the space of 5 day’s impressive. A fantastic start to the New Year. Well done Alex happy driving, I know you enjoyed the motorway driving. It has been a pleasure to teach you. All the best from your driving instructor Paul and all the customer support team at Geoff Capes Driving School. Congratulations to Alex Bailey from Macclesfield who passed his driving test at Macclesfield test centre on the 15th January. Alex had been ill since before Christmas and hadn’t been able to do any driving until the day of his test. Add to that some terrible weather and driving conditions and he really had it all to do. Well done Alex I’m incredibly pleased for you and now you have that driving licence to help you find the perfect apprenticeship. All the very best for the future from your driving instructor Amanda and all the customer services team here at Geoff Capes Driving School.